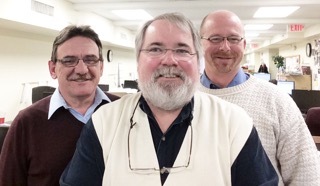 From left are Dave Levengood, circulation; Evan Brandt, editorial; and Steve Gordon, advertising. Pottstown Mercury News currently has 29 active Guild members. Dave Levengood is the Unit Chair. We represent editorial, advertising, business department, circulation and maintenance. It has been seven years since a wage increase was given. Through layoffs, buyouts and retirements membership is down close to 60 percent.